After the count, walking to the highest summit Beinn Chaorach 713m. Stop in the hollow between Beinn Tharsuinn and Beinn Chaorach. Lie on my back. Weak, tired, head on my rucksack, valley before me as a vast mountain punch-bowl. Dark Fairtrade chocolate, nuts, an apple, oatcakes, coffee. 11am, text update to Jennifer then close my eyes, see what happens, thinking of Nan Shepherd and Robert Macfarlane and their naps in the hills. Wake up, look at watch, 11.10. Start to write, then I'll sketch. Why does starting writing almost always feel easier than starting sketching? No sign of ticks this time but keep trousers tucked to socks anyway, and t-shirt to trousers, and despite the heat. Brittle dry underfoot, fissured peat. No sound of humans except now and again the rumble of a plane. A few small dark black flies and some larger with long abdomens and eyes glittering black, legs and mouthpiece yellow, orange red touches on leg segments closest to body, especially hindmost legs. Long antennae. Perches (do flies perch? Is it a fly?) on my writing hand, pause writing, don't damage those legs. Skylarks around and now one rising in song flight right behind me. Meadow pipits peeping calls, close and far, a parachute song flight. Drone and buzz of bumblebees. I've seen quite a lot up here. The five or six I've got close to have all been white-tailed. Rarely I see white-tailed and often when looking at buff-tailed think, "is that a white-tailed?" 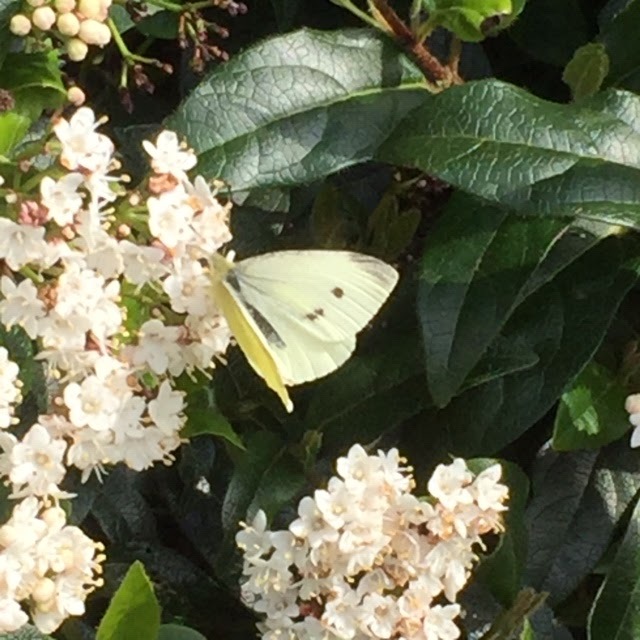 Seeing these today I realise that their tails really are clean white, not buff, their two yellow bands really are cool bright yellow, not gingery like buff-tailed. Flying towards me, a dark thing with orange. Closer... a cockchafer? Closer... close... a ladybird! Passes a foot from my nose. Red wing cases raised and open. Where has it been? Where is it going? 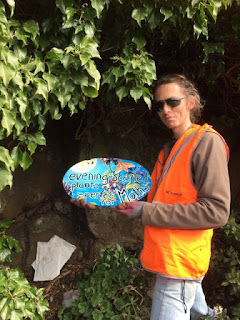 Here are my ten hand-painted signs now installed in our biodiversity garden at Burntisland station, Fife. The project has been led by Margaret and Val of Floral Action Burntisland alongside The Wildlife Friendly Gardener (Neil) and me. The garden has been carefully planned and planted by Neil to be beautiful, colourful, packed with interest, full of life. Once matured it will provide year-round habitat & food & nectar for bees, butterflies, hoverflies, bee-flies (have you ever seen a bee fly? No, wait, of course you have, I mean have you ever seen a bee-fly? - read on for photos), moths, spiders, ladybirds and the endless other little creatures which nowadays so badly need our help. It hasn't been planted to be neat. Neat isn't really what nature needs. The human desire for neat is turning ever more of our gardens and landscapes into bare barren slabbed decked artificial-grassed tarmacked nature-vacuums. Nature needs nature. If you find it hard to move away from feeling neat is best try making some nice colourful / rustic / classy (neat?!) signs to put by the patches you're letting grow - "left long for nature", "wildflowers for butterflies & bees", "seedheads for hibernators", etc. That way you're telling visitors (and yourself) that you aren't neglecting the garden, you're on purpose helping it become a wonderful wildlife haven. Our station garden and my signs give some ideas for things to do in your own community, be it garden or school or workplace or park. Open-fronted nest boxes for species such as robin and wren have been put up in secluded spots and house sparrow terrace boxes are ready to go up when a forthcoming renovation project is complete. A Bug(island) Hotel has been made for us by local school Starley Hall. Posters are still to be displayed to point people in the direction of the biodiversity garden as it's fairly well hidden at the far end of Platform 2. 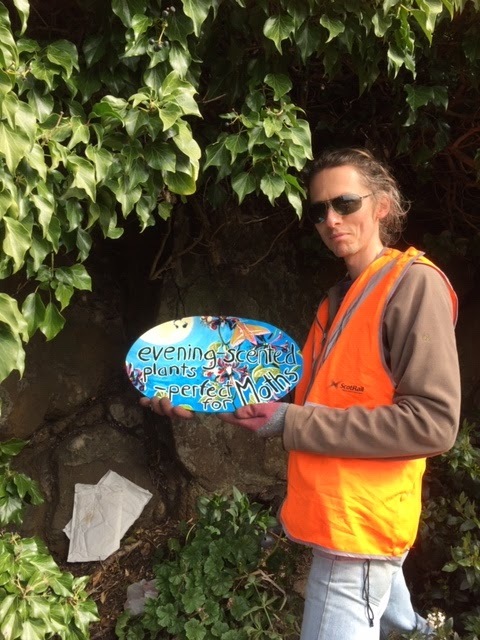 - ScotRail and Keep Scotland Beautiful for the Biodiversity Fund grant which made this project possible. - Fife College, Stenton Campus Fabrication and Welding Dept (Stephen Braid and students) for donating and cutting to shape the sign panels. - Starley Hall school for designing and constructing our Bugisland Hotel. - Scott Pallets for providing wood for Starley Hall to turn into our Bugisland Hotel. A twenty minute train journey south from Helmsdale is Dunrobin Castle station. Dunrobin Castle is a request stop so when you get on let the conductor know where you're going and when you're leaving at the end of the day be on the platform so the driver can see that you're there. The station is closed during winter months. In 2019 it reopens on 30th March. Built as the private station of the Sutherland family, we are now all able to use it via ScotRail services. The station building is wooden Swiss chalet style and through the window we could see an elegant waiting room as in days of old. Cross the road, between square tower gatehouses and along the tall tree avenue to the castle. There's a really good tearoom. With you as you eat your soup is the castle's old steam-powered fire engine, shiny brass, and a stacked display of twenty just as shiny fireman's helmets. There was an excellent falconry display, on twice a day. A gyr falcon, a harris (?) hawk, a peregrine. Soaring swooping gliding plummeting over and through the gardens. In a building on the edge between formal gardens and woodland is the Museum, Victorian in layout - my favourite way. As interesting as they come. Family treasures, artefacts from races and places all across the world, local geology, fossils, archaeology, carved stone balls, carved Pictish stones, Roman oil lamps. And SO many heads, skulls, horns, skins of animals killed by the family in bygone days. Completely fascinating but I was disappointed and perplexed by a lack of attempt at interpretation for today's society - it used to be acceptable to go on safari to kill these creatures, onto your estate to shoot that rare bird (Hoopoe, Golspie, 1800...) but we know better now. I hope the Sutherland family will think to update slightly by using this historic collection to highlight to visitors the plight of much (most!) of our globe's wildlife, and what we can all do to help. A short woodland walk to finish then back to the cosy cottage station to wait on the platform and flag down the return train. A great day out. Go there, by rail! Spend the whole day. Trains to Dunrobin Castle take two hours from Inverness, two hours from Wick and an hour and a half from Thurso. There are currently three trains a day Monday to Saturday. On Sunday there is one train from Dunrobin Castle to Inverness and no train to Thurso and Wick. The station and the castle are only open 1st April to 31st October. Click 'The Highlands then North Highlands Timetable and 'Buy Tickets' on ScotRail website. Many thanks to ScotRail for enabling and supporting my ongoing Scotland by Rail work. In August 2018 we spent a week staying in Helmsdale Station self-catering accommodation on the Far North Line from Inverness to Wick and Thurso. A wet weather idea - if you get a rainy one why not get the train to Inverness and back, just sit and watch out the windows. I love doing that, the journey is the reason. In this third post you can see all the sketches I made from the train during one Inverness to Helmsdale journey, plus two from a different day stuck on at the end. Trains to Helmsdale take just over two and a half hours from Inverness and an hour and a quarter from Thurso. There are currently four trains a day on weekdays and Saturdays and one a day on Sundays. £10 + p&p. Order now. Edinburgh - Royal Scottish Society of Painters in Watercolour 138th Annual Exhibition, until 13 Dec.
Edinburgh - The Sutton Gallery usually have my work in store if not on the wall. Scottish artist & art tutor. Born Edinburgh 1984. Graduated Drawing & Painting from Edinburgh College of Art 2006. Landscape, wildlife, birds and environment are major interests. 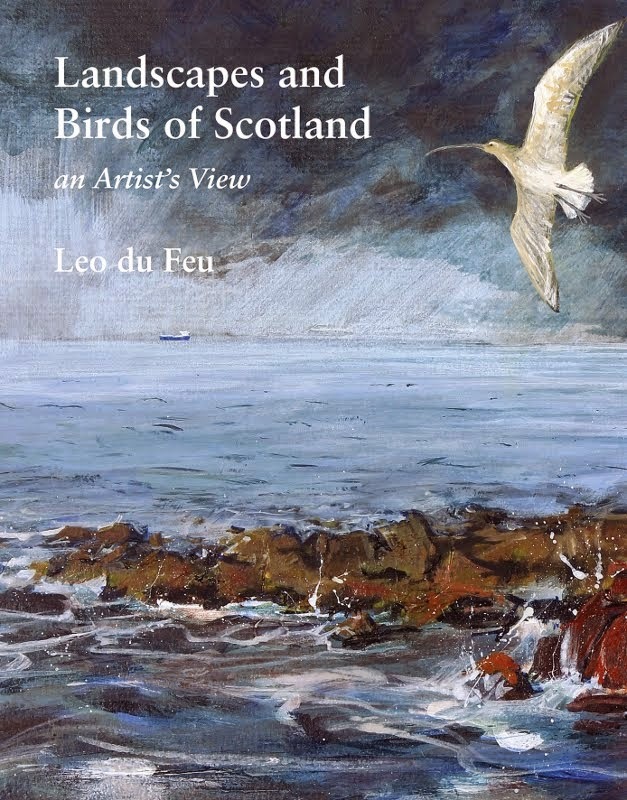 Artworks exhibited throughout Scotland and the UK. Copyright Leo du Feu, 2012. Powered by Blogger.